In the gospel for today’s Feast of Christ the King (Jn. 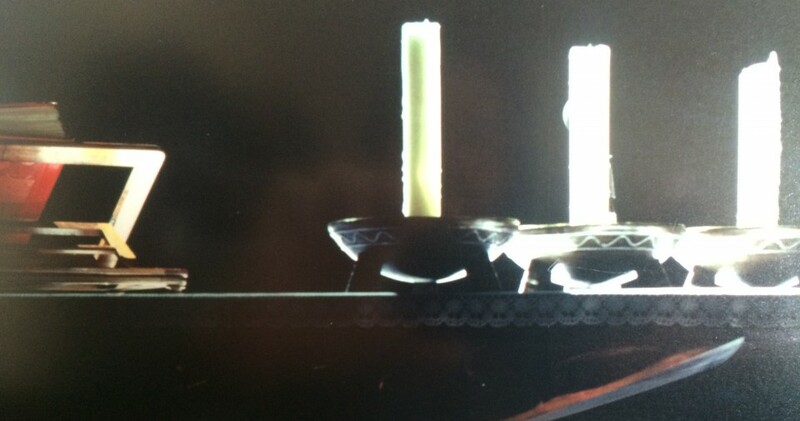 18:33b-37) we are given the humble God. 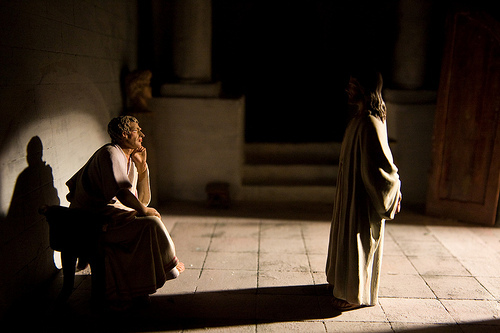 Pilate (representative of all the power of the world) questions Christ – a seemingly defeated and isolated man, abandoned by his friends and followers and mocked by his own people. Humility has more in common with truth than does pride and power. In fact, humility is essential if there is to be any real understanding of truth. If we would know the truth then any temptation to put ourselves at the center of creation (and these temptations come in all shapes and sizes: blue and red, enlightened secularist and righteous religious, male and female, rich and poor, all colors of skin and shades of culture) must be put aside. Everyone (I repeat “Everyone”), needs to accept the purifying light of humility because the only constant, the only necessary is God – all else is contingent upon God’s will. We are not necessary. The more we realize this then the more we open ourselves to those moments when we catch a glimmer that God is indeed the “rock”, the only solid basis of all creation and then gratitude will grow in our hearts. Do you want joy and gratitude? Then look to the one we proclaim “king” yet who never sought that title for himself. “For this I was born and for this I came into the world, to testify to the truth. Everyone who belongs to the truth listens to my voice.” Cultivate humility. It will lead you to truth and truth will bring gratitude. One of my professors in seminary once remarked that the events of the last days as portrayed in the Scriptures should be read like the labor pangs of birth rather than cataclysmic destruction. In fact, the birth analogy is more in keeping with the fuller sense of Scripture than the “cataclysmic, world destroyed in a ravaging ball of fire, Hollywood 2012 movie” interpretation. The texts of Scripture do not confirm, … a sort of “theory of catastrophes,” according to which there must first be a complete destruction of the world after which God can finally turn everything to good. No, God does not arrive at the end, when all is lost. He does not disown his own creation. In the book of Revelation we read, “You created all things, and by your will they existed and were created” (4:11). Notice that in this Sunday’s gospel passage (Mk. 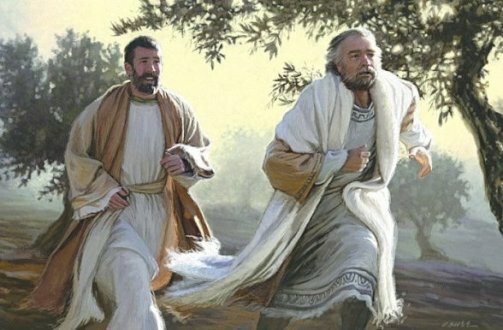 13:24-32) after our Lord speaks of the coming of the Son of Man with “great power” he goes on to state: Learn a lesson from the fig tree. When its branch becomes tender and sprouts leaves, you know that summer is near. In the same way, when you see these things happening, know that he is near, at the gates. Our Lord does enter into our lives and the life of our world with “great power” but the upheaval he brings is an invitation to turn away from sin and the works of sin and to turn toward the fullness of life. As Christians we are to live in this world not bound by the deadening works of sin and pride but rather in the upheaval and pangs of birth of the establishment of the Kingdom of God. Because every day and in every situation Christ is near, at the gates. The Book of Revelation gives us an image of this hope toward which we yearn and work. Then I saw a new heaven and a new earth; for the first heaven and the first earth had passed away, and the sea was no more. 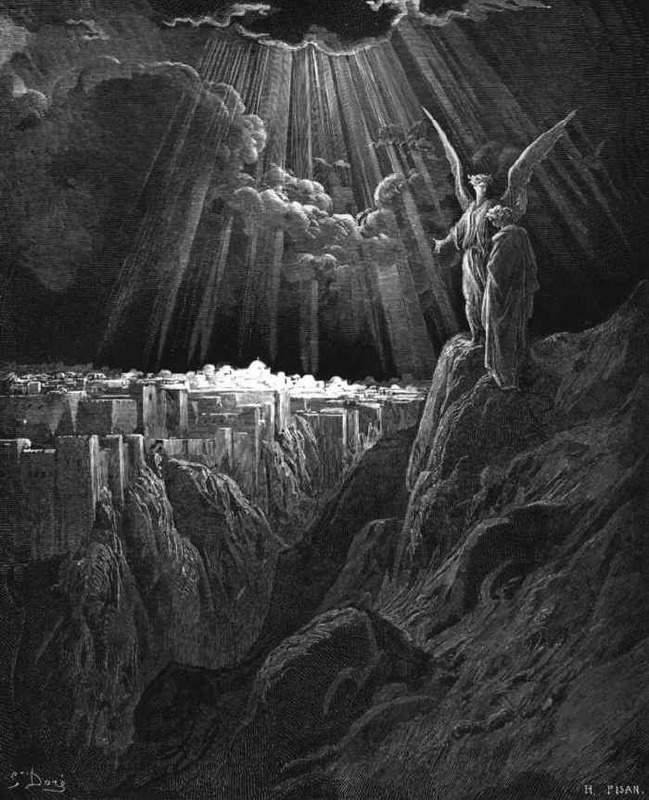 And I saw the holy city, the new Jerusalem, coming down out of heaven from God, prepared as a bride adorned for her husband (Rev. 21:1-2). The great “Day of the Lord” is not yet to happen it has already happened! God has entered into creation and history in the person of Christ, eternity has entered into time, and now this upheaval comes to every generation and even each day. We are caught up in the great work of God where all peoples and nations will be gathered together into the new Jerusalem! Here are a few reasons why I dislike the “Coexist” bumper-sticker. The narrative of the bumper sticker implies that all violence and injustice in our world today is the result of religious difference and that religion is just a source of violence. This is patently untrue. How much violence and injustice in our world today is actually linked to greed, power and pride? These are not the sole provenance of the religious person but rather the weakness of all human conscience. The dictates of religion when authentically lived actually seek to curb these baser human tendencies. It should also be noted that the twentieth century was the bloodiest in human history and the majority of blood spilled was by ideologies that were anti-religion. The bumper-sticker implies that all these religious traditions are fundamentally the same and that any person who seeks to honor his or her tradition uniquely and live by its teachings is some form of extremist. Again, this is not true. Lived faith does not equate to extremism. Respect for one’s own religious faith does not automatically mean a demeaning of another’s faith tradition. It has been my experience over and over again that one of the hallmarks of the truly religious man or woman is a deep respect for the dignity of the other person and his or her beliefs. I would even go on to say that religion truly lived gives access to a deeper and more profound respect for the human person than that which is possible through a bland secularism because through religion one can recognize the presence of the infinite in the other person – a reality that is deliberately denied through secularism. The bumper-sticker seeks to establish a background narrative that people of different faith traditions cannot talk with one another nor get along. Not true. A number of times I have been able to attend the annual Prayer for Peace gathering organized by the Community of Sant’Egidio. This annual event carries on the vision of Bl. John Paul II who brought together the leaders of all the world’s great religions to dialogue together and pray for peace according to the dictates of their own religion. The Prayer for Peace does not propose a bland synchronism nor a diminishing (in Bl. John Paul’s case) of Christianity but rather an authentic living of one’s own faith as the true path toward encountering the other and the true path toward peace. 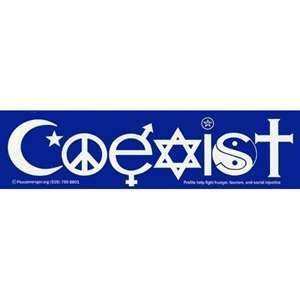 The bumper-sticker implies that peace can only be imposed on religions from without. This is not true. Any honest study and knowledge of the world’s great religious traditions will show that the seeds of peace and reconciliation are found within religious tradition and it is there that these seeds must be cultivated and are being cultivated. Like the book and subsequent movie, “Eat, Pray, Love”; the bumper-sticker implies that any true and acceptable practice of religion in today’s world (if one must practice religion) will consist in a sampling and “picking-and-choosing” approach to religions and religious tradition that is more about confirming what I like and my preferences and ideologies rather than being challenged by a truth greater than me that will enable me to overcome my sinfulness and grow beyond my weakness. What surrounds the arrangements of the symbols of religion that make up the bumper-sticker is the bland, empty vacuum of a shallow secularism. This is what we are left with when religion is diminished and derided. The bumper-sticker in fact proposes a diminishment of the human person by seeking to truncate the capacity for religion and the desire for the transcendent. Humanity is reduced (not achieved) when religion is reduced. For full disclosure I will share that I am not a secularist nor do I find secularism appealing. Has great harm been done in the name of God and religion? Yes, it has. I am not seeking to deny this. What I am seeking to say is that these acts of violence in the name of God are not the essence of religion and are, in fact, themselves a sin against religion and God. To summarily equate religion with violence is itself an act of violence and disrespect. It is also a profound act of ingratitude toward all the good that religion has done and continues to do in the lives of individual people and in the history and contemporary culture of our world. God truly present! This is the Catholic intuition. It is what underlies our understanding of the sacraments, the reservation of the Blessed Sacrament in the tabernacle, the Catholic approach to prayer, mysticism and (in fact) the entire life of discipleship. The understanding of God truly present is also foundational in our belief in the communion of saints which we just celebrated on November 1st with the Feast of All Saints. It is not just that saints were good men and women who did good deeds (worthy of being nominated for CNN’s annual “Heroes” celebration). God became truly present to the world in the lives of the saints and these men and women became truly transformed and reflective of the presence of God. (The Catholic understanding of relics is rooted in this reality.) 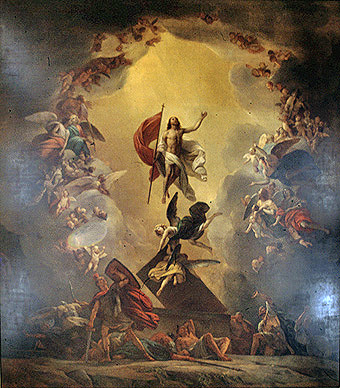 The saints are, in fact, quite subversive because their very lives witness against a materialistic-only view of reality as well as a vague sense of the Divine that is content in keeping God removed and far off. These are both tendencies seeking to be persuasive in our world today, yet the saints witness to something both different and real – the incarnational and sacramental truth of the Christian faith. God truly present as opposed to a vague sense of God who is everywhere but really nowhere. This awareness is not some “add-on” nor corruption of true Christianity. It is the essence of true Christianity and it is grounded in creation through the Word of God and the very incarnation of the Word of God. Throughout the whole of Scripture we find this awareness being revealed and proclaimed. 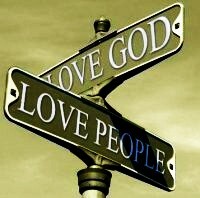 Love of God and neighbor, if it is to be real, must be present. And where true love is, present is God. The saints reveal this truth to us – not just through what they did but through their very lives transformed and reflective of a God not content to remain removed but continually seeking to be present.